An endangered species is any animal or plant species that is in danger of extinction throughout all or a significant portion of its range and/or whose habitat has been drastically reduced such that the species is deemed in danger of extinction. 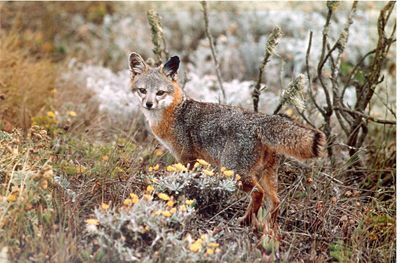 The term has also been extended to other taxa, particularly subspecies (endangered subspecies). The expression endangered species is also used for anything or anyone that is in danger of dying out, such as "conservatives are an endangered species in this area." Many of the causes of species decline relate to the activities of human beings. 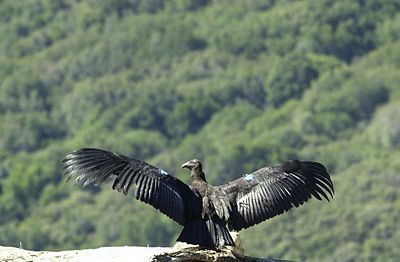 Laws to protect endangered species and their habitats thus place restrictions on human activities and are sometimes controversial. For example, to protect endangered species of fish, water from a stream may be withheld from farmers during a drought, protecting the fish but causing farmers to lose crops. As stewards of creation, human beings have a responsibility to care for all creatures. Human beings seek to find a balance between the care for endangered species and the needs of human communities. In doing so, it is important to involve all values—aesthetic, moral, recreational, scientific, and religious—not just economic values, and to not allow short-term or self-centered economic goals, or individual goals, to dominate long-term environmental sustainability or the needs of the community at large. Many countries have laws offering special protection to endangered species or their habitats: for example, forbidding hunting, restricting land development, or creating preserves. Only a few of the many endangered species actually make it to the lists and obtain legal protection. Many more species become extinct, or potentially will become extinct, without gaining public notice. The ICUN (the World Conservation Union) is the group that governments, scientists, academics, and conservation groups look to for designation of a species as endangered. Its population has been reduced by 90 percent in the last ten years. Its population has been reduced over 80 percent in the last ten years, where the cause of reduction has not been stopped or is determined to be irreversible. Its population is expected to be reduced by 80 percent in the next ten years or three generations, whichever is longer, up to a maximum of 100 years. 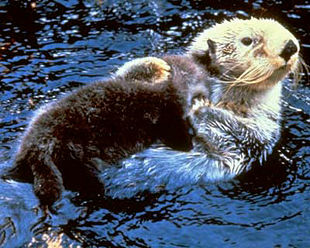 Its population size is estimated to be 250 mature species or less. The ICUN states that a species is considered endangered when the species meets any of the following criteria. Its population has been reduced by 70 percent in the last ten years. It population has been reduced over 50 percent in the last ten years, where the cause of reduction has not been stopped or is determined to be irreversible. Its population is suspected to be reduced by 50 percent in the next ten years or three generations, whichever is longer, up to a maximum of 100 years. The species is known to exist in five or less geographic locations. Some of the more well known endangered species include the giant panda, some whales and dolphins, rhinoceroses, elephants, marine turtles, and the great apes. Other endangered species may not be as well known to the general public, but may play as equal or even greater role to the preservation and integrity of ecosystems. Some endangered species laws are controversial. Typical areas of controversy include: criteria for placing a species on the endangered species list, and criteria for removing a species from the list once its population has recovered; whether restrictions on land development constitute a "taking" of land by the government; the related question of whether private landowners should be compensated for the loss of use of their land; and obtaining reasonable exceptions to protection laws. Sometimes conservation policies call for the re-introduction of an endangered species to an ecosystem, such as the repopulating of Yellowstone Park with gray wolves (Canis lupus), brought from Canada in 1995. However, such re-introductions are an art science, rather than an exact science, since there are too many variables to be sure what is going to happen. History is replete with examples of good intentions having undesirable consequences, such as efforts to manage the Everglades leading to catastrophic exaggerations of the flood-and-drought cycle, or the elimination of DDT, exacerbating the problem with malaria in Africa. Thus, humanity has to have the humility to recognize an uncertainty in knowing what will happen when conservation policy involves changing nature or working with a complex ecosystem. Being listed as an endangered species can backfire, since it could make a species more desirable for collectors and poachers . However, this is usually considered a spurious argument by those favoring loose protection laws. Species may become endangered for several reasons, including introduction of new predators and competitors, disease, overhunting and international trade, environmental change, and development practices. For thousands of years, humans have been transporting animals and plants from one location to another, whether deliberately (livestock) or accidentally (rats). Such introduced species can have catastrophic impacts on endemic (native) species. Sometimes pathogens or parasites are introduced as well. Overhunting has often caused significant species decline, such as the taking of millions of caimans in the Pantanal for their commercial uses, or overfishing of whales. It is estimated that the world’s tiger and rhino species could be extinct within just a few years if international trade in their parts is not eliminated or significantly regulated. Climate change has been an historical cause of extinctions, such as ice ages and other factors involved in mass extinctions. Present climate change may also be a significant factor, such as long, severe droughts causing species to become endangered. Some scientists predict that current climate change trends will perhaps be far more devastating to many of the world’s species than other causes. Development practices that continue to reduce habitat is another ongoing reason species become endangered or extinct. Over 50 percent of the Florida Everglades has been lost since the 1950s, largely due to conversion to intensive residential or agricultural purposes. Every time an acre of rainforest is chopped or burned down, we might be losing a plant that can provide medical value, such as a cure for cancer or AIDS. Some researchers claim this has already happened when they found that the bark of a gum tree in Malaysia showed promise in killing the AIDS virus. When they returned to Malaysia for more samples the tree was gone, chopped down, and no more species have since been found. The greatest factor of concern is the rate at which species are becoming extinct within the last 150 years, sometimes considered part of a mass extinction event called the Sixth Extinction. While species have evolved and become extinct on a regular basis for the last several hundred million years, the number of species becoming extinct since the Industrial Revolution has no precedent in biological history. If this rate of extinction continues, or accelerates as now seems to be the case, the number of species becoming extinct in the next century could number in the tens of thousands. While most people readily relate to endangerment of large mammals or birdlife, some of the greatest ecological issues are the threats to stability of whole ecosystems if key species vanish at any level of the food chain. Species extinction is the obvious ultimate concern for a species considered endangered. There are four reasons to have concern with this outcome: (a) Loss of a species as a biological entity, (b) Destabilization of an ecosystem, (c) Endangerment of other species, and (d) Loss of irreplaceable genetic material and associated biochemicals. The loss of a species in and of itself is an important factor, both as diminution of the enjoyment of nature and as a moral issue for those who believe humans are stewards of the natural environment. Destabilization is a well understood outcome as well, when an element of food or predation is removed from an ecosystem. 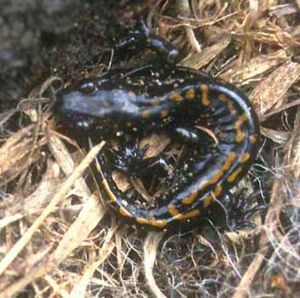 Examples abound that other species are in turn affected, such that population increases or declines are forthcoming in these secondary species. Remove a predator and a prey species may overrun the ecosystem. Drastic change or an unstable spiral can ensue, until other species are lost and the ecosystem structure is changed markedly and irreversibly. The fourth outcome is more subtle, but perhaps the most important point for humanity to grasp. Each species carries unique genetic material in its DNA and in its chemical factory responding to these genetic instructions. For example, in the valleys of central China, a fernlike weed called sweet wormwood grows, that is the only source of artemisinin, a drug that is nearly 100 percent effective against malaria (Jonietz 2006). If this plant were lost to extinction, then the ability to control malaria, even today a potent killer, would diminish. There are countless other examples of chemicals unique to a certain species, whose only source is the species, whose genetic factory makes that given substance. How many further chemicals have not yet been discovered and could vanish from the planet when further species become extinct? The conservation status of a species is an indicator of the likelihood of that endangered species continuing to survive. Many factors are taken into account when assessing the conservation status of a species; not simply the number remaining, but the overall increase or decrease in the population over time, breeding success rates, known threats, and so on. The best-known worldwide conservation status listing is the IUCN Red List, but many more specialized lists exist. The following conservation status categories are used. They are loosely based on the IUCN categories. Extinct: the last remaining member of the species had died, or is presumed to have died beyond reasonable doubt. Examples: Thylacine, Dodo. Functionally extinct: a handful of individuals are surviving, but are unable to reproduce due to health, age, lack of both sexes (in species that reproduce sexually), or other reasons. Extinct in the wild: captive individuals survive, but there is no free-living, natural population. Examples: Dromedary, Przewalski's Horse. The following lists are examples of endangered species. Note that because of varying standards for regarding a species as endangered, and the very large number of endangered species, these lists should not be regarded as comprehensive. American bison skull heap. 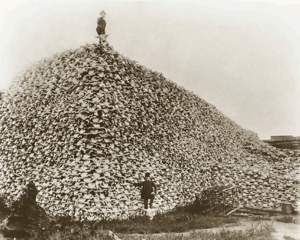 There were as few as 750 bison in 1890 from overhunting. About 6 percent of the 300,000 identified species are endangered due to overcollection or destruction of habitat, among other causes. Pollinator decline is also a factor for some species. Venus Flytrap (Dionaea muscipula) of North America, due to land clearance and overcollection. Wollemi Pine (Wollemia nobilis) of Australia, also known as the “Dinosaur Tree” or “Living Fossil.” Wollemia fossils have been found in Australia, Antarctica, and New Zealand. The plant was thought to be extinct until two trees were discovered in 1994. Research into the horticultural development of the Wollemi pine is being conducted at Mount Annan Botanic Garden and, with commercial propagation well under way, plants should be available in 2005. Eldredge, N. 1998. Life in the Balance: Humanity and the Biodiversity Crisis. Princeton, NJ: Princeton University Press. Leakey, R., and R. Lewin. 1995. The Sixth Extinction: Patterns of Life and the Future of Humankind. New York: Doubleday. Wilson, E. O. 1992. The Diversity of Life. Cambridge, MA: Harvard University Press. Wilson, E. O. 2002. The Future of Life. Little, Brown & Co. This page was last modified on 3 April 2008, at 20:08.